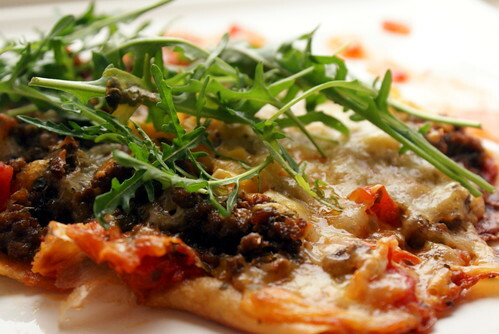 By popular demand, here is a quick and easy recipe to make a home-made, fresh, delicious lamb pizza. For faithful Planet KDE readers who are sick of my occasional food ramblings, please skip this one (again). A little story about this pizza. Signor Portale (better known as Alessandro), our beloved Italian-German Troll who was in Oslo for a visit, once wisely described the typical pizza sold in the common pizzeria as a bread with homeopathic tomato sauce, simply because the crust is so thick (like a bread) and is not even covered properly by those few accidental tiny drops of the tomato sauce. And let us not even talk about the toppings, usually so thin it is more a bread spread then the well-deserved pizza toppings. Hence, the subsequent real-pizza-making sessions with him. BTW, the result of the following recipe has been surely tested by some Trolls, including Signor Portale himself. As a matter of fact, only from him I could complete my amateurish skill by having to learn the magical charms of love and passion, the two most important cooking ingredients ever! It always start with the cooperation between human and microorganisms. Mix the yeast with warm water. Then mix with the flour and some salt and form a dough. Occasionally drop the olive oil. Set it aside, e.g. for one hour, in a warm place until it doubles its size. For the lazy (who isn't? ), just place the dough in a warm (but not too hot) oven and after few minutes, pull it when it already grows. To prepare the meat, sprinkle a generous amount of salt and pepper to the minced meat. Mix garam masala and curry powder, pour in the vinegar and lime juice and then set aside the meat for 1-2 hours. Crush the garlic and chop the onion and shallots, sautee them with olive oil. Mix the eggs as if you would make a scrambled egg. Then finally put the meat. Next are sweet (not salty) soy sauce, tomato ketchup, sliced basil and coriander leaves, bruised lemon grass, ginger cubes. Continue to cook everything with a low heat for one more hour. If necessary, pour in a glass of water and let the water vapors slowly with the heat. You know you are successful when it does not have the typical often-annoying smell (of lamb meat) anymore. Add chopped chili pepper if you like it hot and spicy. Taste and correct seasoning. For the toppings, first of all you need around a glass of thick tomato sauce. If you're lazy or in a hurry, use a ready-made one. Otherwise make it yourself: peel fresh tomatoes, chop them in a food processor, mix the result with sauteed onion and garlic with olive oil, blend some basil, chopped spring onion, and of course salt and pepper to taste. Give another few seconds in the food processor. While waiting for the sauce to blend its taste, slice the aubergine, rub each piece with a drop of olive oil, spray some salt and then bake it (e.g. 5 minutes at 200 C) until it softens. Now knead the dough. Roll the dough into a pizza base. My preference is usually a very thin one (after all, we're making a pizza here, not a bread) but some favor to have a thicker crust on the side. Lay the base on a baking sheet, then spread the tomato sauce and sliced fresh tomatoes as well. After that, add chopped basil, already-prepared-and-well-cooked minced lamb, oregano, baked aubergine slices, corn kernels, and the cheese. As with any other pizza, you are of course free to experiment with your own favorite toppings. For example, olive halves, fine-sliced tuna, pepperoni, sliced onion, mushrooms, preboiled shrimps, or cubes of tofu could be a very nice extra. Never hesitate to build your pizza vertically! Bake your pizza, say at 250 C for 10 minutes. It really depends on your oven, so check it every now and then quickly pull the pizza when the cheese completely melts and the crust looks ready. Serve with few rocket leaves (in some places, better know as rucola) and you are done! Legal notice: You are free to copy, alter, and/or distribute the verbatim or modified copies of this recipe. In fact, do whatever you like with it. This recipe is also provided without any expressed or implied warranties, including if your pizza is burnt or you experience any other casualties. Credit: the gorgeous picture is thanks to this girl and her Sony Alpha.